Gary Shane -- "A Journey to Greece"
I have a long list of people that I would like to thank for giving me the courage to go to Athens and search for a cure for my disease. I feel that God was with me and behind me all the way and for that I would like to make my gratitude clear and bold. THANK YOU GOD!!! I would like to thank my father, James H. Lavenson and his wife Susie Lavenson for giving me the financial support to take this journey and for not trying to talk me out of going. I want to thank my mother, Marian Schatte Lavenson for the financial and moral support that gave me the strength and courage I needed to cross the ocean, and the planet, without fear. Special thanks to my brother Joel for unconditional love and my brother Mike for his clarity and direction and faxes and my little brother Peter who is bigger than I'll ever be. I would also like to thank Vernon A. Martin and family for allowing me to keep my job with leave of absence for nearly two months. Your kindness and support will never be forgotten. Most importantly I would like to give special thanks to Melissa Marion Lavenson and James Caleb Lavenson and Debra Lavenson for their Love and support no matter what. The success rate was high for patients in the final stages of the nervous system disease. ATHENS, Greece  A team of Greek and German doctors said Wednesday they had come up with a revolutionary treatment for multiple sclerosis and preliminary tests were very encouraging." The new treatment was highly effective on people in the final stages of the disease who had tried every other method and had no results." said Dimitris Kountouris, a neurology professor at Greece's Patras University. Koundouris and professor Hans Kornhuber, the director of Germany's Ulm University hospital, said their method used a combination o the cancer drub mitoxantrone and immonoglobins to suppress production of white blood cells. "these are not new drugs but existing ones used in a completely different way and in accordance with each patient's needs." Kornhuber said. "the key is low dosages over a long period of time to avoid side effects." The two doctors said they had tested the treatment on 320 people over 18 months who had seen no improvement with drugs such as interferon and cortisone. "Fifty eight percent of the patients showed a spectacular improvement, 40 percent had some improvement and the rest showed no improvement," Koundouris said. Fifty-two of the patients seemed completely cured, he added. Multiple sclerosis is a degenerative disease of the nervous system affecting mostly white males and females between the ages of 20 and 40. The complete results of the study will be presented in the United States and Germany in February. I found out that I have multiple sclerosis in 1985. All my friends and family were concerned, but no one knew what to do. No one even really knew what to say. I began to receive an endless supply of suggestions, and advice, and countless articles and books and even medical reports. Everyone seemed to have a story of someone or something that could help or even cure. I have been on a relentless search for a relief for my condition. This is my story of my own miracle, my own cure. A divine mystery of overlapping intrigue and self proclaimed befuddlement. A journey to Ixtlan with a very real accent with needles and blood and nurses and one very important doctor and a very special physical therapist. A chance to feel for a brief time, what it would be like to be right on the cusp of medical history. Only I could know what it is like to have an incurable disease and to experience the exhilaration from going to a foreign land and landing smack dab on the head of a cure. Or so I thought, or is it my thought that I was being cured that was what gave me the feeling I was being cured. I have always been amazed how everyone is somewhat an expert on how to help and what I should do to improve my degenerative and incurable condition. It was hard for everyone, and people felt helpless. Everyone wanted to solve the riddle. Some people even got frustrated because they thought I wasn't listening or that I wasn't trying to help myself. I began to see that there was a division in attitudes towards me and my disease. It would be because, sometimes I appear almost, like there is nothing wrong. Other times I could hardly stand up, let alone walk. No one knew what to expect, some people were sympathetic and some were resentfull. Some people even thought that I perhaps, brought it on myself. I mulled over the possibility of karma and even past sins. Some people pointed out that bad diet or bad water or even environmental hazards or even mercury poisoning from the fillings in my teeth might be the cause of my disease. I have, over the years that ensued, met others with varying degrees of infliction. I found that the disease can fluctuate in severity, from person to person and day to day. I am left to contemplate my condition as nothing less than a divine mystery. I could list all the devastating and even bizarre flare ups that I have had to endure. There were times of paralysis, times of intense pain, numbness, and loss of motor skills. Vision problems, speech problems, bladder and bowel problems and even sexual dysfunction. The list seems to be endless at times. Everytime I have a flare up, I seem to, almost, eventually return to normal but each time, over the years, I seem to be a little worse. Degenerative is the medical term that I have come to reckon with. No one can help and no one knows why or what to do. I can do nothing or I can pick any one of the countless "cures" that come my way. The odds are that either response will yield the same result. They say that 60 percent of M.S. patients 60 percent of the time, will experience remission regardless of what "treatment" they are trying, or not trying. This is what I call the "divine con" or the "power of positive thoughtlessness. I have learned that I can "con" myself into feeling better by trying something new or I can just put all thoughts out of my mind by doing nothing. I could make my own claims as to which of the many treatments I've tried, seems to work. I have left no stone unturned. I have found relief from time to time, but I think that most of the benefit that I have received came primarily as a result of just making an effort in the right direction. My brother Michael sent me an article from the Washington Post in July of 1992. It was an article that talked about an amazing treatment for MS. The honey bee sting and the seemingly miraculous results from 10 to 30 stings every other day. OUCH! There were people reporting phenomenal improvement and even cure. All you had to do was withstand multiple honey bee stings. A bee keeper named Charles Mraz along with a young doctor named Brad Weeks were piloting a media campaign to bring the wonderful results for treating MS, to the world. It was said that the venom from a live honey bee was beneficial for arthritis and more recently MS. People were telling incredible stories about how much better they had gotten. and then, the 89 year old bee keeper, Charles Mraz. What a delightful and eye opening experience that was. Brad Weeks had started a news letter called the Apitherapy Society. It had testimonials and more from lots of MS patients as well as arthritis sufferers. Being a medical doctor he was careful to simply organize and distribute the news letter and not endorse the treatment. The medical community would probably revoke his license if he were to speak too openly or loudly about the benefits of the sting. He remained somewhat in the wings, while Charles Mraz did most of the talking to the media. When I arrived at Mr. Mraz"s house that summer, I was very hopeful for results. I dove in head first. I started with six stings and gradually built up to ten , and then twenty stings. I found, at first, the results were spectacular. I immediately could put down my cane and walk up and down stairs. I surprised my friends and family. People who witnessed me getting stung found it very hard to believe and most people could not even watch. After you get stung the honey bee dies. It was truly unbelievable, but, it didn't seem to last very long. I was very happy to get the relief it gave me, but after awhile, it seemed like I only got 15 minutes or so. But it was absolutely free and only the little honey bee paid, with it's life. It was explained to me that the sting was almost the same or similar to a steroid injection. Which is something that is commonly used in MS to abate some of the grueling symptoms. However the side effects from steroids can be very bad and there didn't seem to be any from the bee stings. When Beta seron came out, the media played that up to be the best new wonder drug for MS. I stopped doing bee stings and picked up the hypodermic needle and learned to inject myself every other day with the 10,000 dollar a year drug. My insurance company paid, thankfully, and I tried to keep it up for at least six months. I finally quit because the side effects were just too horrible. Fever and chills and thoughts of suicide were some of the more common problems. I knew there had to be something better, but I never would have dreamed where I was going to find myself. I read the book Celestine prophecy and I thought at first it was a true story, and I was crushed when someone told me it was really fiction. After a while I realized it didn't matter because I was so uplifted by the story. And then I was told that it was poorly written from a literary point of view but it still sold over five million copies. I got so much out of reading that book I could care less if it was well written or not. I didn't care if I was conned or sincerely won over to the story line. I felt there was something there for me. I think I was some how prepared for my incredible journey by reading that spiritual book of fantasy that seemed like reality. And so I didn't listen when everyone warned me of this or that. Everyone warned me, " Don't go to Athens for medical treatment. " and " We know you've suffered with Multiple Sclerosis for twenty years now, but don't go to Athens !" and some friends went on to say, " When was the last time you heard of a great doctor from Greece ?" Even my own doctor warned me not to go, " You could find yourself over there, having complications due to the chemotherapy " he said " and then what?.......What would we do ?.....We couldn't exactly send an ambulance ! " I got warnings about all the negative aspects of going to Athens Greece for an unknown, low level, chemotherapy treatment by an unknown doctor with unknown credentials. But my instincts told me I had to go. So...I went. Everyone warned me if you do go to Athens you will understand what they mean when they say to look out for the people who drive one hand on the wheel, one hand on the horn ! ! Of course there were the warning to beware of Greeks bearing gifts. Also, all the other warnings you grew up hearing about when people talked about Greeks in general. As soon as I landed, I got into my own collapsible wheelchair and escorted into, none other, than.........A MERCEDES CAB ! That was the way my trip to Athens started, with Costas, my first new friend, and Mercedes Cab driver. Costas was an unbelievably energetic and bright face in my dark and unknown future. Costas was also an unbelievably charming " con " artist. With his jet black styled hair and a million dollar smile, he looked like a day time soap opera star . Costas was a ball of energy with a laugh like a roar and an ability to party all night. Later when I found myself in a Bouzouki bar at 4:00 AM with Costas and four other of his merry band of pirates, I realized he had far more energy than I, and to keep up with him would challenge the healthiest man alive, and MY HEALTH was the reason I came to Athens. Except for driving to Canada and vacationing in the Virgin Islands and once walking across the border into Mexico, I have never really left my country. I certainly have never experienced going to another country in search of a miracle cure. I didn't know much of anything about the Greek culture. I speak a little French but definitely not Greek and I found what they meant with the old expression, "It was all Greek to me". I have learned through the years that you can communicate through a lot of different methods. I have crossed the language and age and even gender barriers with my music. I was glad that I had brought with me, lots of musical items to help me communicate. I had my own CD's with my own songs, I had lots of my Sivertone Harmonicas and I had my Vagabond Travel guitar and my various cassette tapes. It wasn't long before I was conversing fluently with Costas in the universal language of Rock and Roll, American style. It was easy to forget about my long history of bodily misfunction while I was getting to know my new friend Costas. When I was nineteen I first came down with vision problems that stumped my doctor. He had no idea, at that time, that I had MS. It wasn't until I was 31 that I was officially diagnosed with this blessed disease. Over the years I have been confronted with a wide variety of challenging disabilities. Most of these symptoms are typical to MS patients. I've had bowel problems and bladder problems. Fatigue and weakness problems. I've had speech problems and lost my ability to do some of the most simple daily functions. I've had shooting ,debilitating pains in my legs and abdomen. There were times I had a pain so intense, I would wake up screaming at night, and begging god to spare me. One time I became paralyzed from my neck down for two months. I was told that I probably would never walk again. Thank god they were wrong about that, but, there are long periods of time where I need a cane just to make it to my car. Sometimes I am so weak that I can't get to the kitchen. I've been given steroids to help deal with the pain and the loss of mobility. I've taken mega vitamin doses and tried acupuncture and chiropractors. I've been to faith healers and psychics, spiritual leaders and support groups. I've had appointments with Neurologists and Research specialists. I've tried medical dowsers and health food diets and macro biotics. I've been to the Ayurvedic clinic to see Deepak Chopra and have even tried meditation. The most profound discovery I made, was when I was told that 60 percent of the MS patients, 60 percent of the time experience remission regardless of what treatment they are trying. That includes the ones that aren't doing anything at all. What a profound mystery. A placebo may be just as effective as an actual medicine. How hard it is to judge sometimes where the benefit to ones well being is coming from. Perhaps one can say that the spiritual experience can produce actual physical healing. Frame of mind can actually be connected to well being. As I said, my health was why I had come to Athens and I wasn't ruling out the possibility that a bouzouki bar until 4:00 AM may have been just what the doctor ordered. Later I would find that Costas certainly thought so. At first, when I got in the cab, we both eye balled each other. It was obvious he didn't speak English very well, so I asked him the question in the Universal language. Do you like American music?" His face lit up and he said with excitement " Rock and Roll ?" I knew right then the ice was broken. " Yes, Rock and Roll " I replied with fervor. I immediately pulled one of my Silvertone harmonicas out of my pocket and played a few blues riffs for him. His eyes lit up and I asked him if he liked the blues. " Yes, I like blues, like blues, much " he said in his broken English. I handed him my harp and said "try it!" he was really happy now. He blew on it for a minute or so and then stopped because he was dizzy and he was starting to swerve on the highway. I laughed and told him he sounded all right and could definitely learn to play the blues. He laughed and then blew on the harp some more. I knew at that point we were friends for life. I guess he thought I was giving the harp to him because, we started talking and he slipped it into his pocket. You had to be careful in Greece when you showed somebody something, they would usually assume you were giving it to them. I had to laugh when I thought of what my friends would say when I told them I made friends with the very first person I met in Athens, a cab driver. Our conversation on the ride to the hotel was very lively and entertaining with lots of questions and wild stories. He asked me questions like, Where from?" or "Where work ?" and I answered "Boston" and "Work hard". I kept it very simple. I began to laugh at some of his choices for words. He really wanted to be sure I understood everything he was saying. Costas told me he was 32 years old and a former paratrooper in the Greek army. I hadn't really thought much about the fact that Turkey and Greece are always on the verge of war with each other. He told me wild stories of parachuting early in the morning over Turkish lines, and of making love to beautiful young Turkish girls and then sneaking back to the military base, after maybe slitting a throat or two along the way. I chuckled not because I didn't believe he could do it, because he looked more than capable, but because of the absurdly matter of fact, light hearted way he described the event. I was very entertained. Costas spoke enough English so he could make himself understood but he struggled very hard to find the right words. He was trying to tell me about a fight with his Russian girl friend, Nadia, he said " I go home and box with her ". I don't think I ever heard it phrased quite like that. I asked him if he liked to hit his women. He looked at me totally confused by my question. I waited a second and asked him again. " Do you ever hit your women ? " He suddenly got very serious and said " Never! I love my women." Then he laughed with a roar. I felt my internal camera jump to an aerial view and saw for a moment Gary in the back seat of Costas's Mercedes taxi, racing down the highway. I felt a rush of emotion as I realized I was actually in Athens Greece. I was actually heading to meet Dr. Kountouris to take the chemotherapy -Immunoglobulin treatment that might cure my condition. I didn't see anything particularly likable about Greece as yet, mostly concrete buildings and clothes stores. I strained to see something remarkable and I caught a glimpse of the Parthenon in the distance as we raced down the highway from the airport into Athens town. I realized pretty quickly, that I was in a kind of, drab city. I was looking for a positive sign and I felt Costas was really the first positive sign, because of his POSITIVE attitude and his fun stories, and how much energy he put into trying so hard to find the right English words to express his wild ideas. I like that quality in any person and I liked Costas and I didn't care if he was a "con" or not, besides I was totally entertained. I told Costas that I was a musician and I showed him one of my CDs. He marveled at my Rock and Roll roots and asked me a million questions in his limited English vocabulary. Costas took me all the way to my hotel and charged me only 3000 drachmas, (about $15.00) which was just about exactly DOUBLE the regular amount. It was my first "entertainment" expense and it was worth it. He gave me his home phone and cellular phone numbers and told me to call if I needed anything at all. I gave him a copy of one of my CDs, which thrilled him totally, and said good-bye. I never thought I would see him again. I knew Costas was some kind of con artist but that was okay I got what I needed and I felt a bit like a con myself. I was on my way to my relief and my cure, and my own miracle. Soon I would meet Dr. Kountouris and start the treatment. "I believe, I believe "I chanted in my head. Who was conning who I wondered. Down deep I was scared but I was very hopeful and excited. The next day at 12:30 I was scheduled to meet Dr. Kountouris and I was planning on taking everything very slowly. I even contemplated not taking any treatment until I got comfortable and talked to other patients and got familiar with the doctor and the protocol. I even thought that if I felt at all uncomfortable I might just stay and just observe for awhile. I definitely wasn't going to jump into anything before I thoroughly checked it all out. All these thoughts were racing through my head over the days before I arrived in Athens, and now that I was there in the ancient city I thought even more about just observing and not participating for the first few days or even weeks. I wasn't going to feel too badly if I decided to not do the treatment at all, if I was too nervous. I don't think anyone would blame me for just turning around and coming home if things were too weird or scary or hazardous to my health in any way. I was just going to take every thing nice and slow and easy. When I arrived at the Ilisia Hotel I was in my wheel chair and it was about 1:45 in the afternoon. I was able (with help from Costas) to wheel myself and luggage to the front desk, where I met Peter (or Patros) my second new friend. Peter was very friendly and spoke English very well. He was very helpful and had good explanations and pointers and general tips about everything. He made a light hearted joke about me being in a wheel chair after he saw me stand up. I explained I only use the wheel chair when I go to the airport or to the shopping mall or have to walk a distance. "Actually I don't really need it at all" I said. ( Who is conning who? I wondered. ) I explained to him I had come to Athens to see a Greek doctor who had a new treatment for MS. Peter could not believe I had come to Greece for treatment when everyone in Greece was going to America for treatment. I admitted it sounded crazy, but here I was. "What is the doctors name ?" he asked. "Dr. Dimitris Kountouris" I replied. Peter thought for a second and said "You know, I have seen him on TV, recently too" I felt some what reassured, and I asked him if he was well respected.
" I don't really know but I'll let you know if I see him again. How long you staying for ?" he asked. " Two months " I said. " and then I guess I get to go home and continue the treatment in the states. I hope I can get home for Christmas." I showed him how I could walk with just my cane. I was a bit wobbly as I sometimes get, he laughed and said I should relax and just stay in my wheel chair. I liked Peters sense of humor. Sometimes I went to Peter just to speak English or just to listen to one of his almost funny jokes. When I left Boston, I was driven to the airport by my younger brother Peter. Being the older brother, I find it difficult when I find myself in the awkward position of having to ask for his help. He always gives it graciously and this time it was no different. Peter always does things with such grace and style and provides me with such reassurance. Not only was he giving me a ride, but, he also gave me a wild assortment of gifts to help me on my journey. There was the miniature compass and the miniature thermometer and the miniature, compact space blanket and a miniature book called New England Notables from his wife Cynthia plus various, healthy and delicious fruit and coconut snacks and nuts. It was a wonderful send off and I have to think of how odd it must have been, at the same time. To send me off , looking so apprehensive and in my wheel chair and then to video tape me as I went through security like I was being incarcerated, and waved my final farewell. Peter didn't really think I should go to Athens for medical treatment. He thought that I should go to Germany to see DR Hans Kornhubber. " there will be less of a language barrier, everyone speaks English and the level of efficiency and sanitation is much better in Germany. The article from the Orlando Sentinel talked of DR Kountouris and DR Kornhubber as both working with the same thing, I think you'll do much better in Germany, besides you will hate Athens. I can guarantee...." It was too late, obviously because I heard a calling. It was just too perfect the way everything fell into place. It was too easy and I began to feel like I was getting little signs. I started to make mental lists of all the amazing coincidences that occurred that gave me sense that I was somehow making the right decision. When I had finally gotten the telephone number for the doctor in Athens and I called, the doctor answered himself. It was far easier to get him than my own doctor in the USA. I began to wonder if it was some kind of scam, but than I realized it was I who called out of the blue and there was no way that he could have been sitting by the phone waiting for a sucker to call. That would have been just too unlikely. No, I felt I had just stumbled onto something incredible. My mother, who is a travel agent with Greenwich World Travel, had booked a hotel near the Doctors office. I was happy. I didn't really even think in advance, of how I would get back and forth to the doctors office. I pictured myself taking a bus or a taxi and I knew no matter what, I would find a way to get back and forth. The problem was, that I really had no concrete idea how the program was going to go. How often I was going to be expected to be in the doctors office, and how often I was going to get Mitoxantrone or Immunoglobulins. There were so many aspects I left in gods hands and in the hands of chance. The least of my worries was where and how close was my cheap little hotel room. I was thinking more on the lines of , how many times am I going to get stuck and how big is the needle going to be. I felt a particular glee, when I found out the Doctors office was less than one block and easy ( on certain days ) walking distance away from my hotel room. I thought that was a fantastic stroke of luck and also that it was meant to be. All my instincts were very aware of how close I am to a coincidence every step of the way. I began to really pay attention to the little signs that I was getting along my way. Before I left Boston, I had read briefly in the new testament. I wanted to see if Athens was talked about at all, in scripture. I found Acts 17 had a part that talked of the time when Paul came to Athens to spread the good news. I was, and still am, fascinated by the thought that I was journeying into biblical lands. I couldn't help but fantasize that I might see a sign on the wall to an "Unknown God ", just like Paul did. It didn't take me long to realize, once I got settled, that sign was everywhere. There were all sorts of signs of worship to false idols. Most notably the huge billboards on every corner of a hansome dude for Cooper cigarettes. Capitalism has many faces and every society has that cross to bear. I think it is far easier to recognize first the benefits of material things than to recognize the benefits of the spiritual. I couldn't believe with all the splendor with the ancient Architecture of the Acropolis and ancient Athens, how incredibly drab the downtown buildings were for the most part. Most people claimed that Athens grew so drastically since 1969 in population that everything was sacrificed to allow for the massive influx of immigrants. I was told that the population went from around 1 million to over 7 million in those short years. It was sad for me when I drove around to see only concrete buildings all around and the Parthenon looming far in the distance. I had to dig to find something remarkable in the neighborhood I was going to be walking in. It was hard at first to recognize the jewels that I was going to stumble on in the streets of Athens. My brother and other family members and some of my friends had all urged me to go to Germany instead of Athens and on the surface even I struggled with taking their advice. I didn't quite know why all the signs were pointing to Dr. Kountouris and Athens and not to Germany and Dr. Kornhubber. Later when I asked if I could meet Dr. Kornhubber, I was told by Doctor Kountouris that I would not be allowed to met Dr. Kornhubber because he hates Jews and Americans. I knew for certain that I had made the right decision to come to Athens and everything was happening for a reason. A day before on Sunday night after all the dust had settled and the plane had landed, I found myself settled in my $50.00 a night room with TV and refrigerator by 2:30. I decided I better sleep and the next thing I knew it was 8:30 at night. I woke up to children screaming and parents yelling in the next room. I went downstairs and hobbled with my cane, over to the fast food place (called Goodie's) that was two doors down from the hotel. I don't quite know what I expected, but I couldn't believe how much the same teenagers were here in Greece as they are in America. I couldn't really get the feeling that I had really left my own country and I was actually half way around the world. Except for the language, everything seemed the same. I thought to myself , once I started to tour the sights, I would surely feel differently. Little did I know, that I would never get to tour the sights, or at least none of the historical ones. I went back to my room and thought about all the incredible presents and send off I got from my brother Peter I was happy that my new friend was named Peter and I felt very much at home in this concrete city. I drifted off to the last of my full nights sleep in Athens. I had an appointment at 12:30 on Monday the 30th of October with Doctor Dimitris Kountouris. The man who had the newest highly, most successful ( over 80% ) Treatment for Multiple Sclerosis. The man that no one knew much about, who only surfaced because of a small newspaper article I found in the Orlando Sentinel. I should say a friend of my mothers found. The use of a chemotherapy drug called Mitoxantrone in low dosages along with Immunoglobulins was the description the newspaper article used. I found, after considerable research, Mitoxantrone was used for cancer treatment but never before used to treat MS. "No side effects" the Reuters news article claimed. It was very exciting. I asked my Doctor if he had heard about it, he said "No". I asked him if he could find anymore about it, he said "No". I said " why don't you call him up?". I then realized he had no interest in finding more. If it was something noteworthy, he felt he would hear about it through his normal channels. By the way I came upon the information was enough to make him disregard it, at least for right now. I realized I would get no help from him in my pursuit of " The Mighty Doctor D ". My doctor had spent the last four or five years trying to convince me to start "Citoxane" and "metheltrexate" both chemo therapy type treatments with highly dangerous side effects. I had basically avoided my doctor and I, at first, had refused to consider anything as lethal as those chemo treatments. When my doctor confessed that his most recent patient died as a result of bladder cancer as a result of doing "citoxane". I got even more encouraged about Dr. Kountouris's no side effect "mitoxantrone" treatment. When I called the MS foundation and the MS society I was told they were trying but couldn't locate this DOCTOR DIMITRIS KOUNTOURIS . They told me they were actively searching the internet and would have more information next week. They told me their phone was ringing off the hook with people looking for more information. They were expecting the internet to provide them with their answers. I guess it took my brains of steel and all my super powers to simply call the person responsible for writing the article. Since it was written by Reuters in Athens I decided to call. The person who answered the phone told me he was eye witness to people being wheelchaired in and by the end of an eighteen month period, walking out. I liked the sound immediately. His name was Costas Paris and he spoke enough English. He also told me the Doctor had over one thousand patients. Then he gave me the telephone number for the person who actually wrote the article. 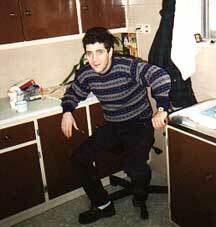 His name was Costas Kipouroupolis, and he also spoke English somewhat. Costas K. gave me the telephone number for the Doctor. That is how I became the first pioneer to make contact with the Mighty Doctor D. in all of America. Or the first fool ? I couldn't help but wonder !.....When I called the doctor he took my call. He seemed to speak enough English and he told me to fax my history , which I did and he faxed me back saying he thought he could help me, but if I came to Athens for the treatment, I would have to stay for two months and then I could continue back in the states. He also asked for my MRI ( Magnetic Resonance Imaging ) and I got a copy from my doctor and I sent it over right away, and I asked HOW MUCH ? He faxed me back and said 500.000 drachmas or about $ 2400.00. That seemed reasonable to me, so I began to make plans right away, to go. I knew soon I would be face to face with the Mighty Doctor Dimitris Kountouris and I was very excited. I knew I had to go. There is no question that I was feeling hope. Hope that I would find some relief from my condition. Hope that I would be able to live "like a normal man". When I play my music, when I write a song, when I perform with my band, I find my heart is filled with hope and joy. When I can share my songs with someone I am filled with hope. When I can share my music with someone, they feel hope and joy and that makes me feel even more joyous. There is something profoundly rewarding when music is shared. I have found my whole outlook on life to be uplifted as a result of a new song. I also can feel very down or depressed when the music is bad. When I write a song that isn't quite the way I want it to be, I can get very down and even lost. I have learned that even my health can be manipulated through my music. I like to think that I can walk better when I've written a hit song. I feel more calm and confident, I can do anything. I can move mountains. I like to think I have some control over my physical condition. Most of the time music is the only thing I have control over. I can feel relief. I can feel hope when ever I want. When I'm filled with despair I can always turn to my music. My music is the only way that I can escape my fear. My song of hope is mine and I want to share it with the world. That is the Silvertone Prophecy. When I awoke at 9:00 AM I had my continental breakfast and then immediately got on the phone and started to call everyone I had on my list. My list was big, partly because I had been fearful that I would be in a foreign country alone, so I managed to create a multitude of contacts to reach when I arrived. There was the Reuters news office where I talked to a Costas P. and then to Costas K. Costas K told me he was very excited to meet me and he wanted to set up radio and TV interviews and he would help promote my CDs while I was here in Athens. I felt like I was going to explode this was too much like a dream come true. Later the doctor would also tell me he would set up radio and TV interviews with his good friend Costas K . The excitement over this possibility kept me "up beat" for days and days. I felt like a big celebrity. It was a good thing that I didn't have to find out until the end of my trip that I would never meet with anyone and never get my interview. I swear that those promises were as much a reason for me to feel improvement as any of the medicine that I was going to be getting. Then there was Costas the cab driver who I woke up and yelled " bring back my harp." He agreed to come over that night. When I called that number, a guy named George told me to call the Groove Sound studio and talk to Christo, the owner. I called Christo and told him George recommended I call and Christo made an appointment to come to my hotel and meet me. I couldn't believe it, I was getting very excited. I was certain that I would have plenty of music business distractions. Then there was the Maharaji who my friend Jerry had given me a telephone number for. ( We were excited when we found they had a group in Athens. ) I hadn't learned much about the Raji but I was intrigued by his approach to life, especially when he talked about contentment. I had watched a few different videos that seemed to leave me feeling better about my life. I felt there was something almost healing or at least calming about the Maharaji. My friend Jerry was an inspiration to me and obviously received a lot of inner strength from the meditation he learned to do. I called the number and later received a fax inviting me down to a Raji meeting on Wednesday night at 8:30. There is no way I could have known about the wonderful surprise I would find when I went to that meeting. I then called the doctors office and confirmed the fact that I had an appointment and I was on my way. Later I called from the list of friends of friends that knew people who knew people or family and had given me a list of phone contacts. I began to make appointments with people who made promises to me and then never showed up. I learned latter that, that was the Greek way. People got me so excited with their enthusiasm on the initial contact, that it took me some time to adjust to the realization that people were good for only a fraction of what they promised. It was now time to go meet the doctor for the first time. When I left the hotel at 12:15, I wheelchaired myself the one block to the Doctors office. I was welcomed into his office by Anastasia whom I suppose would be considered the Administrator, I was happy to find she was expecting me. She was beaming with encouragement. She spoke English quite well and she introduced me to Dr. Kountouris as he came through the room and we shook hands. "Crazy American" he smiled a big warm hearted smile from his big man sized body. He was dealing with everybody as he glided through multiple rooms of his large clinic. In a few brief seconds he welcomed me and made me feel at ease and I believe he was amazed that I was even there. Without the use of the English language I felt some kind of unspoken meeting of the minds. I felt instantly close to the doctor and I think we both felt it. It seemed like we didn't need to say very much we both knew what we wanted and expected and I felt the mutual trust instantly. He had me try and walk without my cane but I couldn't. He watched me as I kind of hobbled around tables and nurses and patients and he evaluated my situation. I was amazed right off, over how many patients with MS were there. The doctor said "Okay sit!" and he was off to another patient. I definitely had the feeling I was in the right place. So many people in my same condition, some better and some worse but all with MS like me. It was profoundly heart warming and calming. All my fears seemed to dissipate and I felt very trusting. I was able right off the bat to find some English speaking patients who told me about how good they were feeling. I dropped my guard and I was totally ready to start my unknown treatment. I had lost all my fears. I had no reason to wait or hold back. I was ready. I then met Christos, the Doctors assistant, and then Stella a nurse who took my blood pressure and then Toola the nurse who took my blood and then hooked me up to an IV infusion and began dripping a clear bottle of something into me. I remember a rush of panic when the first needle plunged into my vein. My mind raced and reeled. That terrifying invasive feeling. I turned my head because I couldn't look. I breathed easy after a moment of pure terror was over. I had no idea that I was going to be getting a new IV twice a day from that first day until I left on December 13th 1995. My arms would become totally black and blue but I would become quite used to it. There were probably at least fifteen or twenty other patients in the two rooms getting IVs at that time. It was very odd, some sitting some lying down. I preferred lying down. Then Doctor Kountouris came over to where I was lying on the table, and welcomed me and praised me for being brave enough to come all the way over from America for his treatment. "Crazy American!" he said with a smile. "You will go home a champion!" I liked the sound of that. The Doctor is a big man with a wave of black hair and a distinctive grey streak and people were coming at him from every direction. The phone was ringing constantly and the nurses had to be constantly instructed and patients were coming and going and men were making deliveries. There was at certain times, an incredible hustle and bustle in the office. The doctor seemed fairly young to me, about 45. I could tell he was over worked and there was a tremendous pressure on him to give answers and to be everywhere at once. I didn't say much but I was taking it all in and then he introduced me to Theo, the physical therapist. I took a lot of comfort when I made the realization that I had already seen about 30 MS patients come and go. Theo immediately began testing my legs and spent about 50 minutes (while the IV slowly dripped into my vein) bending and stretching and finally hooked me up to electronic stimulus machine that zapped me with low voltage charge for about an hour and then he called the Doctor back, and the two of them talked in Greek which I could not understand. "You must go back home a champion" he said to me again. I didn't quite know what he meant but I liked the sound of it. "You are very easy case for me " said Doctor D. "You will be my prize when you go back to America!" Then he gave me a mock "peace sign" and then he pretended to shout "Yankee go home, No more war! Yankee go home!" I suppose in a way the Mighty Doctor D was trying to show me he was from my generation which I suppose is the Vietnam generation, after all he was only about 2 1/2 years older than me. I find it very odd when doctors are my age. I find it hard to trust them unless they are older and wiser. I had no trouble trusting Doctor D and I had no trouble joking with him either. I did have trouble speaking with him, unless I used the Universal language. "Doctor, do you like Rock and Roll ?" he would strum the air guitar and sing "Give me a ticket for an air-o-plane." I liked the doctor and he liked me but he was serious too and so was I and I said to him " Doctor, what's in those IV bottles ? " " Nova flex for spastisity and vitamins " he would say. It could have been anything, I would have opened my veins up to anything the doctor had, I just wanted to get better. I liked it when it felt like I was making progress, and I fantasized what it would be like to ski again and climb mountains, or play ball with my kids and dance with my wife. I really missed my active life. How come I have this disease, I wondered, maybe there is a reason. Maybe there is something I have to figure out. Maybe I've been looking in the wrong direction. Maybe it just doesn't matter what I do. I will always have this disease and I just have to enjoy what I learn on my path to cure. Maybe it just doesn't matter what's in those blue and yellow and clear IV bottles that I saw all the patients getting. Maybe it's my expectations that are bringing me relief. I want so badly for the freedom I used to have but I can't let myself dwell on that, I have to move forward and upward. Why me......I keep thinking ..... Why me ?...... I can't believe I am here in Athens, away from my family and job, trusting, with no questions asked, the only doctor on the face of the earth I would ever trust to give me chemotherapy. Let alone Immunoglobulins, what ever the hell that is. I don't think there is any one else, I know, who would do what I am doing with out question. How in gods name can I be so trusting, what is making me put my body on the table for Dr. Kountouris. Why do I trust this crazy Greek ? Only when I think about what my other options are do I realize why I am here. There is no hope with anything in the American medical world. I think it was the second or third day I was there, when Doctor D told me he might be nominated for a Nobel prize in Russia,( along with Dr. Hans Kornhubber ) for medicine, I felt like cheering . I some how felt that he was the obvious choice, and it wouldn't be long before all the world knew just how great he really was. It was less than three days before I felt much better and stronger. I was feeling incredibly better by the first week and the second week I felt I had found a miracle cure, or something close. I was thinking constantly, from the beginning , how much everyone could learn, from the MS foundation to my own doctor and my neurologist about how to deal with the MS disease. How frustrating it is to go year after year with no progress from the medical world and no hope. Doctor Kounouris brought hope to many and right from the beginning I got to meet a lot of other very hopeful patients. It didn't take me long to find the ones that could speak English. I also met other Americans that were patients. There was a woman who lived on an island and who was originally from Detroit and later I would meet young Mike from Chicago. I was a bit overwhelmed at all the new faces and I made a decision to concentrate on the reason I had come to Athens and to Doctor Kountouris, which was MY HEALTH. I know I felt better and stronger right away. It is hard for me to know if it was the drugs or the physical therapy or both that seemed to have the positive effect. I was totally amazed at the work that Theo did with his electronic stimulus and laser beams and heat lamps and some kind of suction device. I never imagined physical therapy to be like that. Twice a day for an hour and a half. I would feel so good after, that I would get up and walk and move and feel almost like a normal man. I felt that it must have been the combination of Doctor Kountouris"s work and Theo's work that was really the reason for my almost immediate improvement. I felt they were surely the Dream Team. 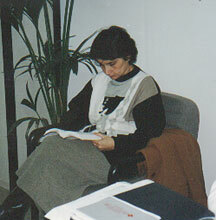 I was then introduced to Marina Angeli the psychiatrist, psychotherapist and flower therapist. The Doctor yelled to her as he was walking away "No alternative stuff for him" he said and shook his head. I asked her what he meant. "My Flower therapy" she explained " it is not for everyone ". I was intrigued and I wanted to know more. "I will explain more tomorrow, we will have more time." We talked for awhile and then the Doctor told me to go home and nap and then come back at 8:00. I was totally bewildered but I did as I was told. I got up to leave and realized that I must have seen at least 50 different patients come and go. All of which it seemed had MS like me. It was now about 4:15 and it was Siesta time and I was ready for my nap. I wheel chaired myself back to my hotel and left my wheel chair behind the stairwell and I didn't use it again until I left Athens six weeks later. my mother and my father and my anger and feelings of abandonment and then I told her about my marital and sexual problems. Everything started to flow out of me like a water fall. I began to cry. I surprised myself with my emotional out break. I think I thought she was going to solve all my problems with the wave of her hand. I chuckle when I remember how she simply acknowledged me and then presented me with the bottle of flower essences. " Here " she said, and she handed me a little bottle that was marked " Bach Flowers ". "This is what you need, try it for two weeks, it should help you adjust to your new environment, and help you with your confidence and self esteem." I marveled at the little bottle and when she told me to drop four drops on my tongue, I did. It was delicious, and she told me to do it at least four times a day or as many times as I wanted or felt I needed. I found over the next two weeks that it did help with my self esteem and confidence just like she said it would. It wasn't just the fact that there was a little bit of brandy mixed with a little bottled water and six of the flower essences there was something good about it. I liked having the little bottle and I would just pull it out when I need to bulster my umph or build up my pizazz. I really can't explain why, but I know I needed something exactly like Marina Angeli and the magic of her flower therapy, to get me through the next eight weeks. After two weeks she brought me a new bottle with a few different flower essences. There are 32 flower essences in all. I was feeling very good and very happy I had made the decision to come to Athens. I think that when I actually saw the large number of patients all with MS, I felt very comfortable. I liked Doctor Kountouris and his staff and whatever was in that IV bottle, and whatever Theo had done electronically, and whatever Marina and her flower therapy was, I was feeling good. I guess you could say I was off to a good start. Eight o'clock came quick and I got a call (after my nap) that I had a fax from my wife, and Christos was in the lobby waiting to walk me back to the Doctors office. When I got back to the office I was amazed again by the large number of patients. Stella took my blood pressure again. Nurse Effie this time hooked me up for another IV infusion and while I was lying there letting the clear bottle of whatever drip into my veins, Theo came over and started doing the same routine on my legs. Bend, stretch and lift and then the same electric zapper for at least an hour or so. I asked Theo what was in those IV bottles? " Don't Know " he answered. Theo told me he and the Doctor had pioneered the constant use of daily IVs for their treatment about eight years prior. Dr.Kountouris came over and asked " How are you Feeling?....compared to yesterday?" It sounded like a funny question to me. "what percent ?" I was confused and I pondered. "What percent better ? " he asked again. Was he really expecting a progress report on my first day ? I thought about my answer. I had to admit I felt better. " That's good " said Dr. Kountouris and then he told me " tomorrow you start Mitoxantrone " and then he was gone like the Lone Ranger. I felt so good I wanted to celebrate, so I convinced Theo to let me take him out for dinner. I pulled out one of my other Silvertone Harmonicas and played some riffs for Theo. He liked the blues and he asked me if he could try my harmonica, I gave it to him to try but I watched him like a hawk. Theo wasn't the type who liked to go out to dinner. Dr. Kountouris called him "a communist" . ( He also called himself a socialist and me an imperialist.) I know Theo's type. He didn't like going out to eat mostly because he hated to spend the money even if it wasn't his, also because he could cook so much better himself. Also, what he preferred to eat was so delightfully simple, that it was certainly not worth paying for. Theo did not like to tip at least no more than five percent. He respected a hard worker but I think he would reward some one in a different way. Maybe just with praise or by coming back. Theo loved grilled fish and that is exactly what we had. I was amazed at his delight at eating the entire fish head and all. He also loved wine and he had no problem finishing the whole bottle. He got very animated by the end of dinner and was making great fun of the American medical world. He also made great fun of me and the look on my face when they came to put in the IV needle the first time. I had to laugh and it wasn't hard to see the humor, I realized I wasn't as brave as I thought I was. My acting was not convincing to Theo. He saw me as the scared boy from America, but he liked me and he couldn't believe I was crazy enough to come all the way from the USA for treatment from the communist and the socialist. Theo believed there was no big deal to my MS disease. I was simply disabled and nothing more and I only needed to build up my confidence and get rid of my fears and I could have my " normal, productive life ". I liked his matter of fact thinking and I wanted to believe in his simple approach. I was very happy I met Theo and there was no way I could have realized how important he would become and that one day he would save my life. I experience fatigue and when I do I usually don't attempt to do much and I usually wait for my energy to come back. I am never really sure sometimes, where I find my energy when it does come back. Sometimes I try and "will" it back, other times I try and take the right vitamins or sometimes I try and exercise in the right way. I have come up with dozens of methods and I sometimes think that I have found one that works. Anybody with MS or chronic fatigue syndrome or any nerve disorder understands what I am talking about. There always seems to be a question of whether it was something I did or just my "positive attitude" that got me back on my feet. If I could only learn to bottle that" attitude thing" I would definitely become a rich man. There were times when Theo would say "your legs are strong, but your heart is week. You think you can't walk but you can". There were times when those words would play over and over in my head. Sometimes ( after an hour of so of therapy ) Theo would come over and just take my cane away and say "Now walk", and I would, not knowing why but I would, and it felt great. However I never seem to loose my fear and I would like to believe that it is possible, but that's just it, I have to believe. Where do I find the faith? I got a glimpse from working with Theo and the Mighty Doctor D who would be almost insulting at times. Maybe it was an effort to snap me out of my self pity. Sometimes I would hobble over to their office and feel so tired after I made the walk and they would say" Tired ,why tired, why always tired tired". "Because I am" I would say. "NO" Theo would say "you not tired, you scared!" I had trouble arguing it felt just like tired to me. Who was conning who? THE SEVENTH INSIGHT the return of Costas and the "Conspiracy"
I had just gotten back to my hotel room at about 4:45 on November 7th when I got a call from Peter that my cab driver friend was here. At first I was bewildered, and then I knew it must be Costas ! " Send him up " I said. A few minutes later, there he was, my noble "Con" Artist. He sat down in my chair and looked at me with eyes close to tears and a smile that was a cover up...... to... what ? A friend died, a relative, a parent...? I could only guess. Then Costas started to sing the lyrics to a very familiar song. His Greek accent and odd pronunciation made it hard for me to recognize but after a few seconds I realized, it was written by ....ME ! " I sing your song....one ... thousand .... dream..... "
I was dumfounded, and then I remembered I had given him my CD when I saw him last. I was totally flattered, he was crying because his girl left him and he was singing one of my better songs and he memorized the lyrics ! I said " Costas, man you've got the BLUES ! where is my Silvertone Harp ? " He pulled it out of his pocket and I grabbed it quick and blew on it long and slow, I made my best soulful sound. " That's the sound of the blues, man, you know what I mean ? " I made that classic blues harp, tear your heart out, sound again. Costas was amazed because it sounded just like his broken heart. He reached out his hand, and said, "How did you do that ?" I showed him again and this time I showed him the beginners 101 method of lip placement and quickly handed the Sivertone harp back to him. He blew on it a bit and then launched into a verbal assault on Nadia. She had taken his money and his heart and had retreated back into the heart of Russia. He said he was going to get her and wanted to know if I wanted to go. We talked about the situation and while he was showing me a picture of Nadia he slipped my Silvertone harp back into his pocket. Costas invited me to go out to dinner with some of his friends. He took me down in the back streets of Athens to what he called a steak house. It was a seedy looking back room of what looked like a barbecue grill. The waiter just started bringing food to the table as soon as we arrived. It was wonderful and greasy and I had my fill of pork and potatoes and tomatoes and bread and beer. Three days later Costas took me out again with his boss Varsilles (Billy) and with Varsilles mother and a few other friends to a taverna. This was even more tasty and a lot more elegant. Lamb and pork and some kind of yogurt like salad as well as other scrumptious delights. I ate very well and Costas was really trying to show me a good time. After dinner Costas took me down to port Piraeus and we went into a bouzouki bar and I sat in a corner and watched one of the strangest events I've ever seen. I have been in a lot of bars, but never one like this. There were women dancing together on the stage and I guess I could have had my pick of which ever one I desired. There was a strange women with plates of flowers and she kept smashing them on the floor. There were people getting up on the stage and singing and dancing to the music of the electric bouzouki. I stayed there until 4:00 AM and I couldn't take it any more so I left Costas there, and got a ride back to my hotel from young Pasos. It was the latest night of my stay in Athens and apparently an early night for the rest of those merry pirates. The next day Costas came to see me and he said he had something he needed to ask me. We sat for awhile while he tried to find the right word in English. He kept saying he had to ask me but he felt he couldn't because he felt like he shouldn't. He was very visual and seemed to really be making a tremendous effort to find the right translation from his native Greek language into the right English meaning. I started to volunteer my thoughts and I gave many wrong guesses. He continued to struggle while I put my jacket on and got ready to go. Finally he said "I how you say, shy"
"Shy?" I said a bit baffled. "Yes! Shy!" Costas said and he grinned with delight because he found the right word. I thought he had found the wrong word for the meaning. I was certain that he didn't know how to use the word in the right context. "I have to ask you something but I shy." This was starting to get a bit ridiculous. "Why are you shy, Costas?" I asked. He began to explain to me that he needed to fly to Russia to "box with Nadia" and he had to leave for the weekend. He needed to ask me if he could borrow some drachmas and he promised he would pay me back when he returned. He was sure he would get something out of her if he went to Russia to track her down. She owed him money and an explanation and he was going to get it, or he was going to "box with her". We went out to eat again and we drove around Athens and he told me all about everything from Athena to Alexander the Great. He told me about the politics and the student strikes, that happened like clockwork every year. He asked me again if I wanted to go with him to fly to Russia. He even said he could get the necessary legal Visa so I could go. That sounded wonderful to me but I had to decline because I didn't want to miss any part of my treatment. I certainly liked the thought of going to Russia but I was headed back to Dr. Kountouris and Theo for my evening dose of mitoxantrone and physical therapy. I loaned Costas around seventy thousand drachmas and didn't really even worry about whether or not he would pay me back. Every time I went out with Costas he always paid for everything. He refused to let me contribute any money. "You my friend, Gary. When I come to Boston you take care of me like I take care of you." That seemed fair enough to me. Once, Costas came to my hotel to take me out to dinner. We were walking into the elevator and he suddenly grabbed my cane and said "You don't need this." He really didn't believe I couldn't walk without my cane. "You walk!" he would say. I was beginning to feel like there was a conspiracy. Nikos later would say the same thing. Costas, Nikes and Theo, were all part of this conspiracy. They were all making me wonder if my disability might be just in my head.
" By this weekend you must play soccer !! " he knew I had promised my son that I would play soccer with him when I got home. " YOU must be ready ! You must be great ! Now show me your walk ! Show me now ! Stand up...up..up ! " He demonstrated how he wanted me to walk, with big steps, " Migalo Vima, Gary...... Migalo Vima " I liked the sound of big step in Greek, " Migalo " and I took one step " Vima " and I took another. I was feeling good and almost showing off, and I even amazed myself. I was walking without my cane while Theo looked on and other patients shouted " Bravo! Bravo! " It felt great and I loved the sound of that word. Even some of the shop keepers on Michalakopoulou street would come out of their stores and yell " Bravo! Bravo ! " when I would walk by at a brisk pace with my cane, and now what would they say ? Would I be walking down the street soon ? I could hear the cheers now ! I fantasized and it felt great! " Go home and rest now, come back at 7 for another infusion. You must be strong for soon you will have Immunoglobulins!" Migalo.........Vima " the cars and the mopeds and the scooters and the buses and the taxis and the motorcycles all rushed by. " Migalo.....V...I....M...A..." each step was a struggle and I couldn't help but wonder.... what was wrong with me ? Why one minute so good and then the next so bad... ? And then it happened I FELL IN THE STREETS OF ATHENS ! All the cars screeched to a halt, a man jumped out and ran around to where I was lying flat. I struggled to stand on my own but I couldn't so I laid back down and it felt good to just lay there and I could hear the hustle and bustle start up again as life got under way again. I felt myself almost drift off to sleep, I realized I wasn't hurt. And then I felt another man on my right side, grab my arm while the man from the car grabbed my left arm and the two of them lifted me up. " Ef harey stow..... Kalah ..... Ef harey stow " I blurted out in my best Greek. " Why fall ? " the man on my right asked. " These stupid shoes ! " I said and I walked away with a wobble. It was a day after day routine. Arrive at ten or eleven in the morning and have two or three bottles IV infusion, and then across the street to Theos for physical therapy. Then back to my hotel for a nap, and then back to the doctors by seven or eight for another IV infusion and then back to Theos by eight thirty or nine for more physical therapy. It seemed after two weeks or so of daily doses of mitoxantrone and twice a day physical therapy, I would have fabulous moments of strength and exhilaration. I remember feeling so good when I was able to walk without my cane, that I wanted to tell everyone. I would fax my family and write my friends and I wanted everyone to know. I kept thinking about how wonderful it would be to go back home under my own power and not in my wheelchair. I started thinking about what my doctor would say when he saw my improvement. I started thinking about how much everyone who suffers from MS could benefit from this treatment. I think I started to become very emotional and perhaps intense about my feelings. I kept thinking about trading my wheelchair for a bicycle. What a wonderful thought. What a wonderful headline for a MS newsletter. "Man arrives in wheelchair and leaves on bicycle." I was that man, or so I was thinking. I felt I was going through something the entire medical world soon be hearing about. I was very very excited. I was also feeling very very angry. Angry because my own doctor had not been more helpful and supportive of me coming to Athens. Angry because the MS foundation had not been able to find any financial aid to give me. I had called the MS foundation before I came to Athens and asked if they could help subsidize my trip, or at least get me a lap top computer so I could communicate efficiently. I had talked to a woman, named Terry, who thought it was possible and she would try and get authorization to supply me with a lap top. She told me she would have to wait for the board of directors meeting at the end of November. I felt that it would be to everyone's best interest to supply me with the time and cost saving device, so I could make daily full reports to the MS foundation. I also needed something so I could begin my journal. I didn't feel I was asking for too much and I even said that I would reimburse them when I returned. The trip was going to cost close to ten thousand dollars, and if it weren't for my parents financial aid I probably would never been able to come to Athens. I pictured myself, with my lap top, communicating on Internet with the world. The money that I could save on phone and fax alone, would justify the purchase. Plus to have the ability to write in my hotel room and then report in a professional manner was very worthwhile. I felt everything that was happening to me would be of great value to a tremendous amount of people. They then had reported back to me that they had no funds available. That made me very angry. I felt they were missing the opportunity to have first hand, eye witness, up to the minute reports from an actual patient. I was very angry and very emotional and I called my mother on the phone and I whispered "Mom, don't tell anyone, I'm going to trade my wheelchair for a bicycle." I wanted her to be the first to know of the incredible news before it hit the newspapers. This was going to be the biggest MS story ever. The MS foundation and the MS society were going to be scrambling to get interviews with me. My own doctor would be begging me for forgiveness. He would certainly be begging for all the details of this incredible medical journey. The profits from selling my story would certainly provide me with enough income to pay back my wonderful parents for supporting me, and probably have enough left over to pay back the MS foundation for my lap top. My mother hung up the phone and immediately called the rest of my family and told them that I was undoubtedly on some kind of mind altering drug. I told everyone they were in my band, and we were going to shoot a video right in the doctors office. I began to explain to everyone what their part was and what they would do and where they would stand. I had a very clear idea of exactly how it would go. Everyone seemed to laugh and think it was a great idea and Doctor D said he would get me a video camera and Niko said he would be the camera man and Stella and KiKi and Toola said they would wear my Silvertone T-shirts, I just happened to have three that I brought with me from the states. Doctor D would pretend to play guitar and Theo would pretend to lip sync like he was playing harp and Christo would pretend to play the drums all for the camera of course. The only problem was when to shoot. The office was always so busy except siesta time or after 10 o'clock. Doctor D told me, we were going to go on television and the radio to tell my story and to promote my music, maybe play a song or two and perhaps one of my CDs. The Doctor asked me if I could play "the Letter" that old song by the Box Tops...."of course" I said. I was very excited and I faxed everyone the news. There is a trail of coincidences. Literally and obviously and far too noticeable to just pass over as only circumstantial. A trail of coincidences that led me where I was. I followed my trail blindly but I was truly led by some kind of inner light. Some kind of premonition that there was direction and I was following my instincts like they were subliminal messages to my internal compass. I somehow knew exactly where I was going. All the pieces of the puzzle seemed to magically, fall into place. All the separate pieces had there own meaning and gave me direction to the next piece. I like to think of it as a series of minor miracles. Almost like a million little events, falling on my head like drops of rain. Some of the messages were about my health, and some were about my spirit and others were about music or my friends or my direction. So many events and little miracles I almost lost count. I like to think over all the different ones. There was the original coincidence when my mother received and sent me the article on Dr. Kountouris in the Orlando Sentinel, and I was the only one in America to make contact with him. There was the incredible coincidence of the hotel being one block from the Doctors office. Of course there was the fact that the Raji meeting was only two and a half blocks away. And then there was the fact that the first person I met was George the American drummer at the Raji meeting. 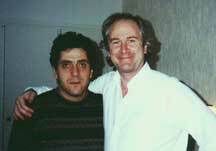 He had just been talking about me with Christos the ADAT recording studio owner, earlier that day. What an incredible coincidence that I would run into George at the Maharaji meeting that I almost didn't even go to, and right away upon the first time I meet George to be told that he had been talking to someone earlier that same day about me, when he didn't even know me, even though he was told that we knew each other and were good friends. He was as confused as I was and it took us quite awhile to make sense of it all and sort it all out. It turned out that after I had called the number from the ADAT world wide directory and talked to a guy named George there, and he gave me the number for Christo at "Groove Studio"(the best ADAT studio in Athens)and when I called Christo, I told him that George told me to call. Christo thought the George I was referring to was the George the drummer (who is American) who I meet at the Maharaji meeting by a total fluke accident. When I first met George he said "My friend Christo told me about some American from Boston that was in town and said I was a friend of his." I was confused for a long time then I realized that the person I first talked to from the world wide ADAT directory was named GEORGE ! It was I who had told Christo that George had told me to call so Christo assumed George (the American drummer)and I were old friends and that was the George I was talking about when I said George told me to call. It was obviously George from ADAT that told me to call Christo and not George the drummer. With George's help I was able to set up a recording session at Christ's "Groove Studio" one evening with one of the hottest bands I've ever played with. Christo on lead guitar, George on drums, and Stalios on Bass guitar. Stalios was incredible, played bass like a veteran and he was only nineteen years old. Christo was a virtuoso on lead guitar and George was the perfect time keeper. I was in need of something besides the doctors office and the IV needle. I needed something uplifting because I was feeling depressed about being flat on my back day in and day out. I needed some musicians to feel at home with. I convinced Phillip from Senor Frog restaurant to come with me and be my guide to get out to the studio. I was amazed at how well things went and I left about 12:00PM with the best recording I've ever done. I am planning on releasing a CD of the seven songs I did. The positive and perhaps even curative powers of music are something I have known about for a long time. It is probably one of the more purely satisfying experiences I had on my journey to Athens. Then there was the chance meeting with Elia at Othellos restaurant. I was eating with Theo and his wife and daughter, when I heard an American voice behind me. I turned around and said "Where are you from?" she replied "Boston, of course what about you?" I was a amazed to meet someone from my home town all the way over there in Athens. She asked me why I had come and I told her for medical treatment, and I showed her the original Orlando Sentinel newspaper article about Dr. D that I was carrying around with me. She was absolutely amazed and she told me she wanted to write a story about me and Doctor D. She was a writer for the Athens News and the Boston Globe and she told me she had been very frustrated because she had had nothing good to write about. My story was just the thing she had been waiting for. She was sitting with a photographer for the Athens News and they were both there because they were doing a restaurant review for the paper. I was introduced to Niko and told that he was also a bass player, and since I was looking for a bass player for my recording session. I felt that it must have been divine province that led me to Niko and Elia. After I finished my dinner with Theo and family I said goodnight to them and went over and sat with Niko and Elia and had some wonderful chats. Elia explained that Niko was very hungry to play some music and she was hungry for a good story to write about. It seemed all too perfect for me and we drank a little more wine and I invited them back to my hotel room. Niko and I began to make plans to play music and he told me he could get me gigs playing in some of the little clubs in Athens. I thought that was great and I asked him when and where. Niko was one of the few people I met in greece that did exactly what he said he would. In five days I was hired to play at Senor Frog Mexican restaurant. He would call me every day right up until I left Athens and would always check on me to see how I was doing. 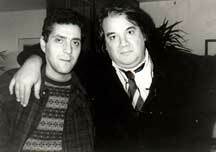 He was a wonderful friend and a great musical buddy. Then Niko introduced me to Phillip LaVerre an American and John from England the owners of Senor Frog. They were very excited to have me performing at the restaurant and Phillip was a guitar player and John was a drummer so we decided to make it an "open mike night" and we all planned on making music at the restaurant. Niko helped by bringing equipment and he also planned on taking photographs. Then Niko got the Athens News to write about my appearance (they wrote a very nice blurb about me and my fabulous musical career)and that is how Christopher Kuhn read about me being in town. He was curious so he showed up on the Sunday I was scheduled, with his girlfriend and listened to me play and bought three of my CDs and offered me a gig at his cafe Istias on the island called Evia for next summer. There was the woman that was a barmaid at the bar that Christopher took me to that got very excited and took my telephone number at the hotel and gave it to her sister who was married to a man who had MS and needed to talk to me about the treatment I was doing. He called me the next day and invited me to an MS society meeting at the American military base on the outskirts of Athens. When I went with Dimitri and his wife Claire to the MS society meeting I was amazed to run into a guy who was a patient, named Phillip, whom I had met at Dr. Kountouris's office. He told me that he didn't want anyone to know that he was taking Dr. Kountouris"s treatment. He told me Dr. Kountouris was not well respected by the MS society and the medical community. He asked allot of questions about all the things the guest speaker was talking about, and never made any mention of Dr. D.
Everything was in Greek and I couldn't understand. Dimitri's wife Claire was English and she was nice enough to translate a little for me. At one point it seemed to me that there was a bit of an argument between my fellow patient and the guest doctor, that was speaking. I asked Claire to tell me what they were talking about and she did. It seemed as though my fellow patient wanted an explanation as to why you could feel so good one day and so badly the next. The good doctor said none of the medicines would give anyone improvement. Once you had nerve damage that was it. He said that was just the nature of the disease. My fellow patient didn't seem to agree but he still didn't mention anything about Dr. Kountouris. The doctor started saying that the most promising new drug coming on the market was Miller, the oral myelin pill developed by David Hailer at Bright and Woman's hospital in Boston. He got everyone very excited about Mylorel and said that they were looking for volunteers to test in a double blind study in the pre trial studies. What he didn't say was the fact that Mylorel was only 27 percent effective and seemed to work better on men than on women. Dr. Kountouris"s treatment was 80 to 95 percent effective on both men and women and the MS society and the medical world didn't seem to care. Certainly I was among the few that knew anything about Dr. D and his mitoxantrone and immunoglobulin treatment. One night Dr. D decided to walk me home to my hotel and time me, as to how long it took to go from his office to my hotel front door. Eight and one half minutes it took me to go the distance. When we arrived at my hotel the doctor said "good job" and then he introduced me to a man that happened to walk by. He told me that man had been in a wheel chair until he did the treatment and now he was walking like a normal man. That got me excited to see and then Dr. D told me something that I'll never forget. He told me he was on his way to the hospital because he had been called to verify that the Prime Minister was brain dead. While all of Athens was hearing from TV and radio and newspapers that the Prime Minister was improving from his coma, I was hearing that certain people were thinking and verifying that he was indeed brain dead. The media definitely had a different story. I went to George at Othello's restaurant and said "did you know that the Prime minister is brain dead?" He couldn't believe it because he had heard the report that he was improving from the TV and the papers. I told him what Dr.Kountouris had told me that he verified that Andreas Pompandaous, the prime minister of Greece was indeed brain dead. George was mystified and couldn't respond to what I said at all. I was feeling I was one of the few that knew the truth. I was a bit reluctant to tell anyone but George seemed like he could offer me some kind of perspective. When I saw Dr. Kountouris the next day, he said that it was absolutely definite. He had a strong heart that he had transplanted from a young soccer player, but his brain was gone. All of Athens was being misled or maybe just me. It was either one or the other. There was a lot of things I was to learn on my journey to Athens. A lot of things that will probably take me years to sort out and be able to explain. Some things that I can remember and just laugh about because of their absurd nature. One day I took a Taxi ride to visit the top of Lacavitos, the mountain with the Greek Orthodox church on top. I went there specifically to yell my son Jamie's name from the top. Yell his name so loud I promised him he would hear me. ( probably in his sleep, because of the seven hour time difference ) After I did that I went to visit my friend Niko. He owned his own eye glass store in a part of Athens that was about a 45 minute cab ride away. Niko made me a very nice pair of reading glasses and bought me a cup of espresso and we had a very nice visit which included a look across the street in a clothes store where I resisted buying a leather and silver belt. Niko's brother Lucky, was able to flag down a taxi. I found out it was 300 to 400 drachmas more if you called a cab verses flagging one off the street. I was very thankful Lucky was able to flag one down for me. Niko explained to the driver where I was going because he didn't speak any English at all, nor was he interested. We began the 45 minute ride back and needless to say there was no idle chatter. I was very surprised when the driver pulled off the road across a parking lot and around some buildings into a gas station. I thought that it was very strange when he pulled up to the pump and waited for the female attendant to pump his gas while the meter was still running. I asked if he was going to stop the meter while he was getting gas. He looked at me with a puzzled look. I pointed to the meter and waved my hand and I think then he understood. Now he was angry, and I could tell by the way he drove away from the pumps, he didn't feel there was anything wrong with me paying for him to get gas. After all, didn't I know he needs gas to make his cab go? We headed back on the road and that's when I got my first taste of Athens rush hour traffic. 2:30 to 3:00 is not the time to go anywhere in a car in Athens. The traffic was bumper to bumper and everyone was beeping and honking and screaming at each other. One hand on the wheel one hand on the horn. Mopeds and motor scooters and motorcycles were zig zaging and cutting each other and everyone off. People were standing on the side waving trying to flag a cab down. I was totally stunned when my cab driver stopped to pick up a passenger. Before I could say anything in comes this guy in a suit and a brief case who jumps in the front seat. I was dumbfounded, and I asked the man if he spoke English. He said yes. I told him I didn't understand and was he going to help pay my fair or was the cabby just going to deduct it or what? The man laughed and said that it was very normal for cab drivers to pick up additional fairs especially at rush hour. He then explained to the cab driver what I had asked and now the driver was really pissed at me and I suppose I don't even want to know what he was saying. Then the man in the suit with the brief case got a call on his cell phone and the cabby turned up his radio and I was in the back seat feeling like a jerk. I remember one night I was jamming with Theo in his apartment \ Physical therapy office. He began to tell me how he spent from the age of 20 to 30 wandering around living out doors by himself on the islands around Greece. Sometimes he wouldn't see anyone for months at a time. With just a stick, he could live off the fish he would catch and be totally happy. There were times when a friend wanted to join him and he would laugh and say "You could never take it, you wouldn't last two weeks!" He was right, most of his friends that tried only lasted two days. He had no problem just being alone. He married Georgia when he was 33 and they have a seven year old girl named Thesbina. Georgia lives six hours north in Thesolaneki and it didn't seem to bother Theo that he only got to see them once a month. Theo told me a great hitch hiking story. At night once, he stopped a car by lying down in the street and pretending he was hurt. People drive very fast in Greece and he must have been scared when a BMW roared to a halt right by his head. The driver felt badly and when Theo said he was hurt the driver offered him a ride to the hospital. Once he got in the car and got on their way Theo had a miraculous recovery. It was 5:00AM on December 10th I woke up in my hotel room and realized I was shaking with a fever. I tried to move and I felt panic serge through my body. I could only move my head and my arms. I could not move my legs at all. Nothing.... I couldn't even sit up to pull the covers off my legs. Panic..... I had to think...I couldn't reach the phone it was about two feet too far...... I decided to try and sleep. I woke up at about 6:20 and I still had the shakes and fever and I had to cool the room down and I still couldn't move. I was just able to pull the phone over so I could call Peter at the front desk. "Peter I can't move, please send someone up to open my windows and get me some air. I'm boiling and please bring me some bottled water." " Are you dressed ?" he asked. had any thing like this happen since 1990 when I ended up in the Beverly hospital paralyzed for over a month. I fell back down on my bed with my two legs hanging off the side and I fell into a sleep. I woke up at ten twenty and called the Doctors office and Stella answered. I said " Sella tell the doctor I'm sick and can't move!!" She said okay with a worried sound and hung up. The doctor called back at 11:30 and told me to sit tight and I had obviously caught an " infection ". He said he would send some one over with medicine. He was only one block away and I couldn't believe it took until 3:20 for Christo to show up and give me some pills. He felt badly for me I could tell by his eyes. Christo didn't speak English very well, only the Universal language. " Play blues Gary !" he gave me the thumbs up. I nodded and said "Ef harey stow Christo" and then he was gone. I sat there and cursed Doctor Kountouris and cursed Athens and cursed my doctor back in the states for being right. I realized what Doctor D was warning me about when he told me my immune system was suppressed, I guess that means I could catch anything and I should be really careful not to expose myself to.... what ?...Everything....? How was I supposed to defend myself from the unknown ? What had doctor D done to me that made me such a victim ? I couldn't believe he would just leave me here. I couldn't believe what was happening to me ! Suddenly Theo walked through the door, just like Robin Hood with a bag that had everything he needed. I couldn't believe how up lifted I was to see him. That crazy communist who always seemed to bring me back to life. He had to actually pick me up to move me to the other bed and then he immediately hooked me up to an IV of Antibiotics, actually two. I asked him " what happened to me ?" Theo shrugged his shoulders and said "Don't know" I said to him " You saved my life ! meh eso ses !" It was nothing to Theo, and he laughed when I told him I felt like I was going to die. He had simply put antibiotics into me. Nothing more nothing less. On my last night in Athens I was lying on the table at 11:00PM at Doctor Ds office. I had my final doses of Immunoglobulins and a number of other clear and yellow bottles. The Mighty Doctor D came in late with Anastasia and gave me his parting instructions and farewells. He told me that I had received over eight thousand dollars worth of Immunoglobulins, compliments of Dr. Kornhubber. He warned me of the importance of keeping my "psycho balance" and my moral up. He reminded me of his story about the bird. How the bird effortlessly flew down from the mountain and struggled to fly back up. He said it was very important for me to fly level and even and not to go up and down. He also told me if I had any problems to write and not to call. Nurse Effie took five bottles of mitoxantrone and five bottles of nova flex with vitamins and put them in a box and taped it up. She also included five disposable IV needles and clamps. I was a bit baffled because I saw that there was nothing written on the bottles or anywhere at all. The question came to my mind of how was I supposed to carry these bottles back home? I thought for sure that I would be stopped at customs. When the doctor came, he brought a Christmas shopping bag and put the box in it and said to just tell customs that it's plant food for my grandmothers plants. I laughed because I thought he was joking. I was a bit apprehensive when I got to the airport. I decided to use my wheelchair to get around in the airport. It helps because I get extra attention. Even though the language barrier was still a problem, most of the airport people were very helpful. Just after I arrived, the bag with the medicine I was carrying, broke. Quickly, two attendants ran over and began to help me tape the Christmas shopping bag with tape that read "cleared through customs". I was very much relieved and amazed because I obviously, now, had no problem getting my illegal drugs through customs. By an incredible stroke of luck and perhaps another fabulous Silvertone Prophecy coincidence. The plane ride seemed to last forever but I arrived safely back in Boston in nine hours. When my wife came to pick me up at the restaurant called "Angie's" in Revere, I took one look at her and I knew something was wrong. She told me right off that she wanted a divorce. It was quite a welcome home and I had jet lag so badly that I literally went to sleep for two days and I refused to take any phone calls. I still seemed to have a touch of the flu and it was a few days before I felt up to dealing with anybody. My father was so upset with me for not calling him the moment I arrived back home that he still hasn't talked with me to this day. He was very insulted and considered my act as purely selfish. Even though I tried to explain that I was just too overwhelmed to call anybody, he could not forgive me. When I returned to America I was back only two weeks when I got a call from a woman who had read the newspaper article that was written about me and my journey to Athens. She said to me that she wanted to help me and she invited me to her house to watch a video. She told me the video was about Dianetics. I was familiar with L Ron Hubbard and Scientology but I went to see the video. She tried to suggest that I could experience miraculous cure as a benefit from Scientology. After that, I got a call from a friend of mine that said I could experience miraculous cure as a benefit from becoming a Christian Scientist. I am very opened minded and I will not rule anything out. He is going to bring me a book so I can read about the power of prayer and the holy spirit. About a week later I received a phone call from Dallas Texas, from a doctor who had also read the article. He had looked up my number and called to find out all he could about the treatment I had done in Greece, and about doctor Kountouris. I gave him the doctors telephone number and explained to him the problem I was having in getting the IV infusion. It was difficult to get any one to consider helping me administer the unapproved drug. The Texas doctor told me he would contact the Greek doctor and would help me find someone to administer the drug. Meanwhile when I finally talked to Dr. Kountouris myself, he told me he would contact someone at Harvard medical school and get back to me. I was still waiting until Dr. Kountouris wrote me and told me that he would not be able to put me in touch with anyone that could help me. My own doctor here can not help me because insurance doesn't allow this particular treatment because it is not approved for my condition. The mighty Doctor D wrote again and said to take metheltrexate as a supplement until I could continue the mitoxantrone treatment. After being back for two months I found out that Theo had a heart attack and he stopped working with Dr. Kountouris his last telephone conversation with me he said "Doctor is bad man, Gary!" It seems my "dream team" no longer exists and perhaps only did for my benefit or so it seems. I would guess that this is all part of my Silvertone Prophecy.